Are you fed up with your job? Do you wish you could find a way to be your own boss, "make money from home", and increase your income on your own terms? If so, then make sure you read this . . . There is nothing for you to "sort out" by yourself. The plan is uncomplicated and easy for anyone to follow each day. It takes you from "Beginner" to "Winner" in 30 days! A lot of people have the talent to write, you're probably one one of them. Trouble is, getting started is the hardest part if you don't have a proven success plan to follow. You have just found that proven success plan. You can begin your freelance writing success in just moments from now. As a freelance writer, I wrote The Internet Tutor as a ghostwriter named "Simon" for several years and an audience of nearly 100,000 subscribers. I'm also a published book author and write and sell all sorts of content, so I know a little bit about freelance writing. If you want to be a freelance writer, I've put together this guide for people just like you. You can work from the comfort of your home. The benefits of this are enormous, including things like the "30 second commute to the office" and the "dress however you want" dress code. And let's not forget—no boss and no workplace politics. You can work from anywhere in the world. It only takes an Internet connection and a notebook computer to make it happen. Work from a cafe, the library, the park, or even the beach! You still have to write, but your "office" can be wherever you're comfortable. You enjoy a flexible schedule and get to set your own hours. No more 9-5 prison, you can even work in the middle of the night if you want—that's when I like to write. In the daytime I go biking, walk the dog, garden, whatever I feel like doing ... and no alarm clock! You get to choose your clients. As the boss of your own freelance writing business, you don't have to put up with difficult clients if you don't want to. You set your rates. You no longer have to be told what you are worth or let someone else determine your paycheck, its now your decision. Writing is a creative, satisfying activity (I have a hard time calling it a "job" because I love it). This is one of my favorite things about being a writer. Wouldn't it be nice to do something you really like when it comes to earning an income? Now is your chance. You can get started quickly with little or no investment. Once again all you need is a computer and an internet connection to get started. If you're reading this page, you already have what you need to get started. Content is still king and always will be. There will always be a demand for writers. Think about it . . . in just a few short years we went from writing primarily for a few thousand magazines, newspapers, and books to BILLIONS of websites needing content! The demand for writers has EXPLODED! The pool of writers has grown too, but most of them don't understand how to succeed. They don't have a portfolio! To make it as a freelance writer you have to show some samples of your work to get hired. Sadly, many never figure this out, even when they keep getting passed over for writing gigs. I teach you how to overcome this starting on Day 2 of the 30-day guide. They don't know how and where to find clients! If you don't have clients you don't make any money. Don't let this be your roadblock too, because starting on Day 10 I am going to show you how to find clients via a variety of different resources. They don't know how to execute for success! Most don't know that the reason they are failing in their freelance writing business is due to poor execution. Starting on day 24 I will share with you the 4 execution secrets that will help you overcome one of the biggest road blocks to success. This guide, 30 Days to Success as a Freelance Writer, will show you all that and a whole lot more. By the way, even though it's a 30-day plan, you could get your first gig before you reach the end of the course. Wouldn't it be nice to finally avoid the normal struggles that come with money making endeavors? Wouldn't it be great to significantly shorten the learning curve? You can do that when you are equipped with the right knowledge and tools to overcome the roadblocks that always slow everyone else down! This is where you decide the type of content you'd like to write. Here you'll find out how to set prices and accept payments. Need clients? No problem. I'll show you where to get loads of clients. You'll learn how to find what your clients really want (even if they're being vague). Here you'll discover how to fulfill the order and meet (and exceed) your client's expectations. Here you'll discover how to go from making extra money to making a good living! You may be wondering if you need experience or even if you need a degree in journalism or some other credentials. Nope. I earn a great living writing, and I didn't have any applicable experience. Nor do I have a college degree. In an informal, non-scientific community survey, a group of writers were asked about their income. They were asked to anonymously reveal how much money they brought in per month through writing. Of this small sampling, 44% averaged under $1000/month, 27% brought in between $1000 and $2000 per month, and 28% brought in over $2000 per month. Keep in mind that more than half of these respondents worked less than 8 hours per day on average, and more than half had less than one year of experience. So yes, it is very possible to make good money as a writer. Of course, there's no guarantee you'll make money—it's really up to you—but 30 Days to Freelance Writing Success does come with a money-back guarantee. You don't have to be a great writer, but if you have the desire and basic skills to write, this may be just the opportunity you've been looking for. In this 30-day guide to freelance writing, everything is broken down into easy-to-follow daily action steps for 30 days. Most of the daily assignments are very quick to complete (you could easily do more than one assignment on most days if you wanted). My money making A.U.T.H.O.R. formula that helps you weigh your options, receive payments, identify clients, take an inventory of needs, execute the work order, and reach your potential. How to build your portfolio, the importance of building a portfolio, and 8 important areas to include in your portfolio. How creating samples, giving away freebies, and offering introductory specials can influence others and help you build your portfolio. The 8 primary types of content to focus on; plus you will learn how to choose a specialty. How to price your services, how to choose a payment structure and the 2 ways to handle it, and how to accept payments. I will also give you the 5 best options you can use to accept payments. The 4 important questions to ask yourself to help you identify and profile your target market. How to find loads of clients and the 8 best sites to use. Further, I will show you in detail how to use these sites to your advantage. Discover even more ways to find clients through free classified ads, press releases, and how to find clients offline. Yes, many businesses right in your area need content too, and most are clueless how to use the Internet to find writers. How to create a website that showcases your services, starting with basics like choosing a domain name, and how to get hosting. If you don't do web design, you will also discover two methods of outsourcing to get your site developed, and a do-it-yourself tutorial on installing your own blog. Lastly, you will discover the 4 elements you need to include on your website. The 3 reasons a blog is very beneficial in attracting clients and 3 easy steps to get search engine traffic to your blog. How to attract new clients through Pay Per Click Marketing (Google AdWords) and how to get others to send you targeted leads through Joint ventures and/or an affiliate program. Note that you can earn money without advertising, but you have the option to use part of your earnings to get more clients and increase your income that much faster. How to take inventory of your client's needs using a questionnaire (sample questions included), learn how to avoid miscommunication, and discover the two things you must never do. What YOU MUST DO before you ever write a single word for a client! This covers expectations, how much you will be paid, payment structure, scope of the project, delivery deadlines, revision terms, guarantees, and more. This is easy enough, but it is also MUST HAVE knowledge! The 4 "Execution Secrets" for turning first-time clients into loyal (even rabid) repeat buyers. Hint: These secrets are what seperate the very succesful freelance writers from everyone else. You will get numerous tips, ideas, and examples showing you how to master each of these secrets. The 3 best times to ask your clients for their repeat business, plus the 3 main ways to ask your clients for referrals, and how to get a client to increase his order so you earn more per sale. The 4 types of bad clients that you need to fire as soon as you recognize them so they don't waste your time and keep you from earning more money. This 60+ page guide is concise, but comprehensive. No fluff. No filler. Just simple meaty steps to follow, taking you from "start to finish". 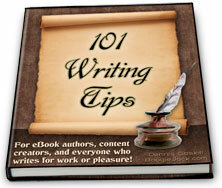 For a Limited Time, You Get 101 Writing Tips for FREE! 101 Writing Tips is a FANTASTIC ebook for writers, and for a limited time I'm including it with 30 Days to Freelance Writing Success for free! It sells for $17 by itself here. This ebook is for writers of all kinds, amateur and professional. Whether you write for print or for the web, you're sure to discover several tips that will help you in your writing. So whether you write books or ebooks, website content, newsletters, sales copy, fiction or non-fiction, there are nuggets of writing wisdom in 101 Writing Tips ready to help you write better, faster, and smarter. You also get my Special Report, Press Releases Made Easy, as a second bonus. As you will discover much to your delight, you can and should - and will want to - issue press releases! This sells for $7 here. That's $24 worth of bonuses—it's like getting my brand new 30 Days to Freelance Success for just 3 bucks! I can't offer both of these products for free indefinitely though. At some point in the near future I'll replace 101 Writing Tips with a slimmed down "lite" version of it, and use that to promote the full version. Although I'm sure you'd love to get started, you might be thinking in the back of your mind, "what if this isn't for me?" Listen, there's no need to say "Yes" at this point. Just say "maybe". Order 30 Days to Freelance Writing Success below, and go through the 30 daily steps to try it for yourself. If you try it and it doesn't work for you, then email me back and I'll credit your money back. 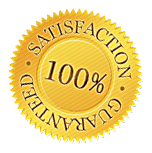 If you aren't completely satisfied, just email me and I'll refund your money. It's that simple. You get to work through the 30 daily assignments at ZERO RISK to yourself. Go ahead, try them out. Test this system thoroughly. I'm confident of the results. At any rate, you have nothing to lose. And money to gain. Perhaps a lot of money. 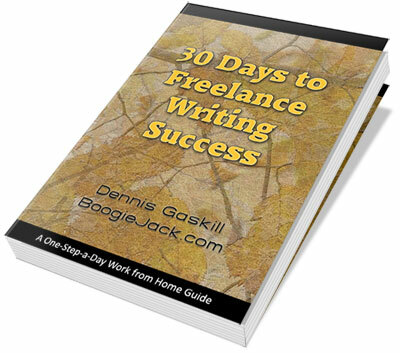 Get 30 Days to Freelance Writing Success Now! YES—this is exactly what I've been waiting for! I'm eager to learn how to make money as a Freelance Writer. 30 Days to Freelance Writing Success, 101 Writing Tips, and Press Releases Made Easy is just $27.00 today—but 101 Writing Tips may not be included for long, after all, it sells separately for $17 by itself. I could decide I'm giving too much away at any time. Every effort has been made to accurately represent this course and its potential. I cannot and do not guarantee you'll make a specific amount of money or any money at all. Please remember that each individual's success depends on his or her background, dedication, desire, effort and motivation. As with any business endeavor, there is no certain guarantee that you will earn any money. Remember, you get to try out the entire system - literally work through the 30 daily assignments - BEFORE you decide if you want to keep it!